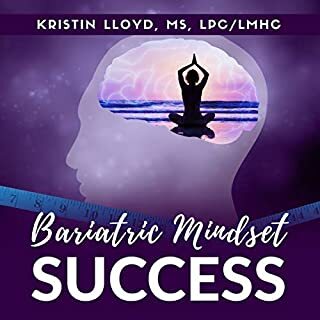 In Bariatric Mindset Success, you will be guided by Kristin, a professional psychotherapist and a successful gastric sleeve post-op patient, through her most coveted weight-loss surgery success strategies. 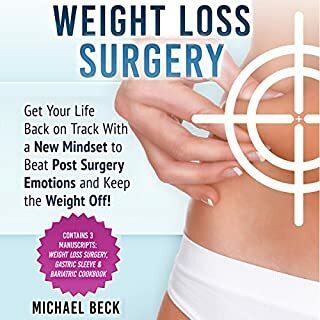 She'll guide you through the weight-loss surgery basics as well as advanced mind-set, motivation, and emotional techniques to help you stay focused and on track through the ups and downs of life. Great book with awesome narration!!! 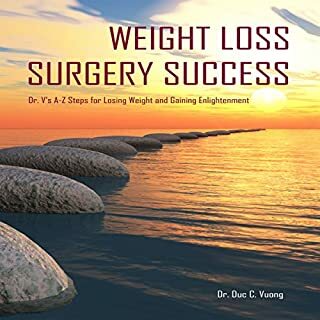 In this book, Dr. Vuong offers pertinent psychological and self-improvement tips that are necessary for success after weight loss surgery, which is a rarely covered topic. Drawing on his professional experience working with obesity patients and his own personal journey for enlightenment, he has provided a concise yet profound manual for losing weight and gaining enlightenment. Are you looking for an answer to your weight problem? Have you considered weight loss surgery or a gastric sleeve? Are you worried that surgery will change how and what you can eat? Obesity is an epidemic of the modern world that is sweeping across the globe and affecting millions. Dieting has become big business, of course, but what do you do when that isn’t enough? Are you prepared to take more drastic action? Losing weight through surgery or having a gastric sleeve fitted is an option, but these invasive procedures should not be taken lightly. Weight loss surgery is a big deal, but it is only an early step in your weight loss journey. The long-term weight loss journey begins after the surgery, and it lasts for a lifetime. 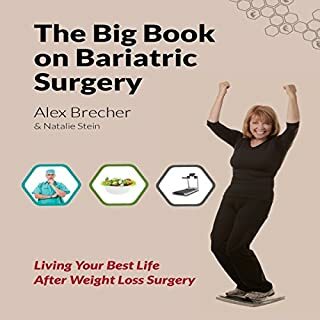 The Big Book on Bariatric Surgery: Living Your Best Life After Weight Loss Surgery is your guide to losing weight and living a healthy life long after you are discharged from the hospital and are on your own. If you're ready to shed more than just the weight, listen to one woman's remarkable journey of self-discovery and healing. In Diary of a Fat Girl you gain an intimate view into how one woman overcame her past and began anew. Through Lisa Sargese's heart-wrenching (but often laugh-out-loud funny) memoir, you'll be inspired to discover your inner strength and drive to triumph in your own life challenges. Losing weight is achievable. You can lose all the weight you want just as long as you know how to. The knowledge is all you need to know. After that, you must put that plan into action. This is how you will learn to make the foods that will make this process enjoyable. You can enjoy dieting food. The trick is not to enjoy it too much. Everything in moderation. Secondly, nutrition is a predominate part in keeping you healthy. Stranger Here is the brutally honest, surprisingly hilarious story of one woman's journey from one extreme of the weight spectrum to the other, and of the unexpected emotional chaos it created. Insightful and unsparing in her self-examination, Larsen depicts the exhilarating highs and devastating lows she experienced as a result of her weight loss, the incredible joy of finally beginning to look like the image of herself she's always carried inside her head, and the crushing pain and confusion of feeling like a stranger in her own body after losing the weight that has always defined her. This audiobook describes the typical diets doctors recommend for the weeks leading up to gastric sleeve surgery. You'll learn how to choose the right surgeon, the (rare) risks and rewards of various treatments, and what to expect after your gastric sleeve procedure. It's important to stick with the diet your physician prescribes after your surgery. 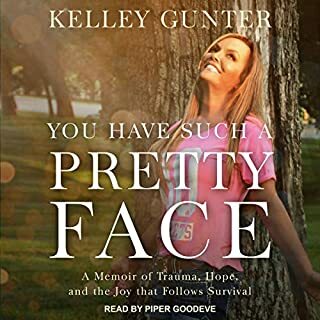 In this audiobook, you'll find out about the different foods you can eat during the different phases of your recovery. The laparoscopic adjustable gastric band, or Lap-Band, can be the weight loss tool you need to overcome obesity - but only if you use it right. The Big Book on the Lap-Band: Everything You Need to Lose Weight and Live Well with the Adjustable Gastric Band! is your complete manual, from considering surgery until maintaining your goal weight - and everything in between. This audiobook has everything you need to know about gastric bypass surgery. Learn the risks and the benefits of the surgery. This is your guide to gastric bypass surgery with everything you will need to know about gastric bypass. Don't take any chances; inform yourself before you take on such a big change. The vertical sleeve gastrectomy, or gastric sleeve, can be your weight loss solution after years of struggling with obesity. Thousands of patients have successfully lost weight and kept it off after vertical sleeve gastrectomy. Making the right decisions can help you make the most out of this life-changing experience. 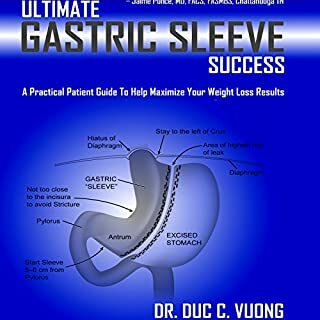 The Big Book on the Gastric Sleeve: Everything You Need to Lose Weight and Live Well with the Vertical Sleeve Gastrectomy! provides the information and tips you need to make the most out of this chance to overcome obesity forever. How does the gastric sleeve work? Is the vertical sleeve gastrectomy your best option? Who will your surgeon be? What will your diet be like? How can you reduce complications and side effects? This complete guide covers the entire VSG journey - don't miss out on critical information that can get you the weight loss that you want and deserve! Highly recommend this book for anyone thinking about bariatric surgery. It covers before, during and after. It explains all the different procedures. Makes you think about whether or not you should even have a procedure..... Just get it. Have you listened to any of Pam Dougherty’s other performances before? How does this one compare? From your first thoughts of weight loss surgery, step by step through preparing for the surgery, to everything you may expect. It also covers recuperation, each stage of eating, and support & exercise. The know it all guide for anyone with questions about the vertical sleeve gastrectomy. 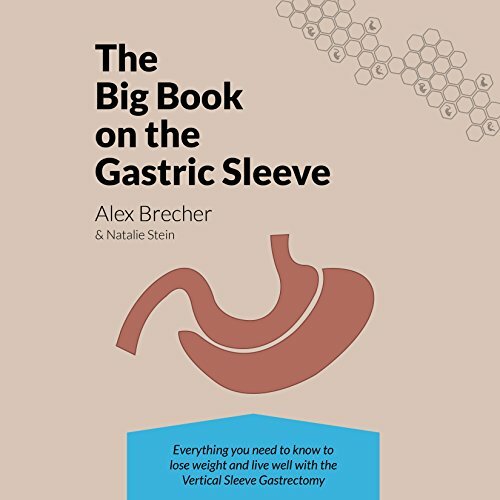 Would you listen to The BIG Book on the Gastric Sleeve again? Why? Absolutely! This book is packed in with great information on the Gastric Sleeve. For me, it has given me advanced knowledge of the physical and the emotional side of having this procedure done as well as explaining everything that I will encounter as I go through the process. I really like the four or five personal stories from actual patients. I am glad that they included the good and the bad in this book. What about Pam Dougherty’s performance did you like? Very soothing speaker. I listened to this mainly while driving and I could understand her very well. Everything you EVER wanted to know and MORE on the Sleeve! The only time I got bogged down in the book was in a small part when it got really technical on the topics of measuring food and the exercises. It was still informative but there isn't really anyway to get around the technical part. Appreciated the audible version because I might have skipped it if I had read it in the physical book. Will never know. It doesn't work on my Kindle Fire. Not sure why they let you sign up when it's impossible to access. This is a great resource for anyone interested in knowing more about the vertical sleeve gastrectomy. it answered most of my pre- surgery questions.